In August 2015, the JASP welcomed high school students from the Nihon Fukushi Daigaku Fuzoku Koto Gakkou’s taiko club, “Rakko,” in Mihama as part of the TOMODACHI/NAJAS Grassroots Exchange Initiative. The theme of this program was “Leadership in the Arts,” which engaged students in cross-cultural communication about art and the leadership skills necessary to create a thriving cultural environment. At the same time, this program enabled musical exchange, as students taught songs and performance techniques to Pittsburgh Creative and Performing Arts (CAPA) students and had a joint performance at the end of the exchange week. During their stay in Pittsburgh, the students visited city government, local arts organizations and museums, and Mitsubishi Electronic Power Products factory. Through their visits, they learned the role that arts organizations played in Pittsburgh’s renaissance. Furthermore, they could bridge differences between Japanese and American culture and continue their interest in the arts in their career, in their community, and across international borders. In August 2016, ten Pittsburgh students and two chaperones traveled to Mihama, Aichi prefecture to complete this program, staying with host families, visiting cultural sites, and practicing with their Japanese counterparts. Read their blog to find out more about their journey. The TOMODACHI Initiative invests in the next generation of Japanese and Americans in ways that strengthen ties and deepen the friendship between the United States and Japan over the long term. We seek to foster a "TOMODACHI Generation" of young American and Japanese leaders who are committed to and engaged in strengthening U.S.-Japan relations, appreciate each other's countries and cultures, and possess the global skills and mindsets needed to contribute to and thrive in a more cooperative, prosperous, and secure world. 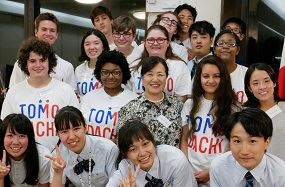 TOMODACHI is led by the U.S.-Japan Council and the U.S. Embassy Tokyo, and is supported by the Government of Japan, corporations, organizations and individuals from the United States and Japan. Visit www.tomodachi.org for more information. Thank you to our generous contributors for the Generosity campaign!